Donovan Capes is second in the UK Under 13 discus rankings. Young Donovan Capes is continuing to follow in his famous family footsteps. The 11 year-old grandson of British athletics legend Geoff Capes has been setting the throwing circles alight both indoors and out. He finished his first indoor season ranked third in the UK Under 13 shot putt rankings and at the weekend made a stunning start to the 2017 outdoor campaign. The Bourne Academy pupil, who competes for Nene Valley Harriers, took part in the Bedfordshire AAA Open Meeting and in his first ever discus competition he took the honours with 27.06m to go straight into the UK rankings at number two - just 19cm off the number one spot. He threw 9.97m to win the shot, which was his best outdoors but a little down on his indoor PB of 10. 65m. Grandad Geoff was a British, European and Commonwealth champion who competed 67 times for Great Britain and Donovan’s dad Lewis and his Aunt Emma, Geoff’s two children, were also shot putt champions. Nene Valley seniorsAndrea Jenkins and Tim Needham were also in action. Jenkins won the senior ladies hammer with 49.50m and finished third in the discus (39.83m) while Needham was runner-up in the Over 60 hammer (29.93m) and third in the discus (30.95m). Peterborough Athletic Club’s Lewis Davey started his outdoor season in fine form, breaking Tony Jarman’s 37 year-old Under 17 boys 400m club record by 0.6 seconds, writes Nichola Gibson. Davey’s time of 49.40 at the Lee Valley Open meeting is also an English Schools qualifying time and places him third in the early-season UK rankings. He also recorded a PB of 11.69 in the 100m. Younger brother Ronnie also ran well, setting PBs in the 100m and 75m hurdles. Jamie Horne opened his season with a victory in the high jump with 1.97m, just 4cm off his best, while Ellie Forrest finished seventh in the 300m hurdles in only her second attempt at the event. PAC results: U17 100m - 4th Lewis Davey 11.69; U13 100m - 3rd Ronnie Davey 14.48; U17 400m - 5th Lewis Davey 49.40; U13 75H - 3rd Ronnie Davey 14.27; U13 300H - 7th Ellie Forrest 51.44; SM HJ - 1st Jamie Horne 1.97; U13 LJ - 20th Ronnie Davey 3.90. 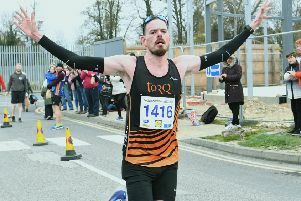 Martin Glendenning of Bushfield Joggers was crowned Harrier League Champion after the final race of the series at Lynch Wood, writes Barry Warne. Glendenning, whose dramatic improvement throughout the series kept him one step ahead of the handicapper,held off strong challenges from series runner-up Sophie Wilkinson-Hargate of host club Nene Valley and Richard Coles of Thorney. The race was won by Yaxley youngster Mark Devine in a time of 19:48. On the night the quickest times were set by Peterborough AC’s Phil Martin with 16:13 and Wilkinson-Hargate who clocked 20:23. Fastest times of the series were run by Nene Valley’s speedy duo Alex Hampson (16:04) and Ruth Jones (20:10).